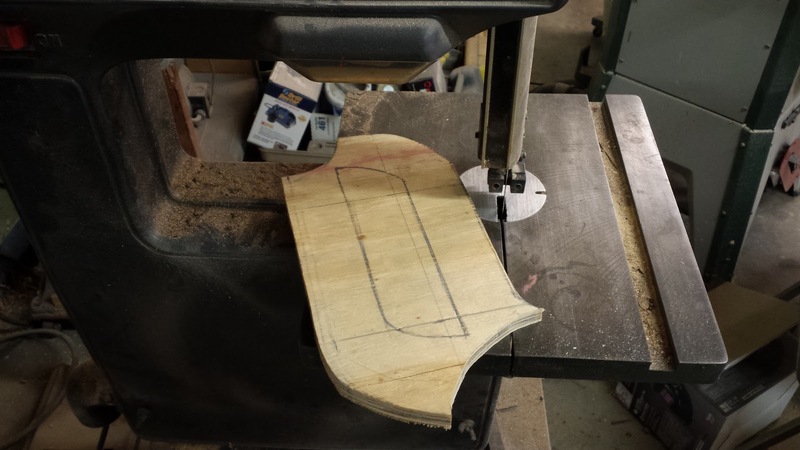 This project has been a long time coming. 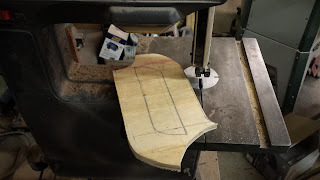 I started work on it about a year ago, and I intended to publish a post about it when the project was finished, but now I'm thinking that because it is a big project with multiple parts, and also because there is some concern whether or not it will ever get installed, maybe I should piece it out into a couple of posts, and start publishing them now. 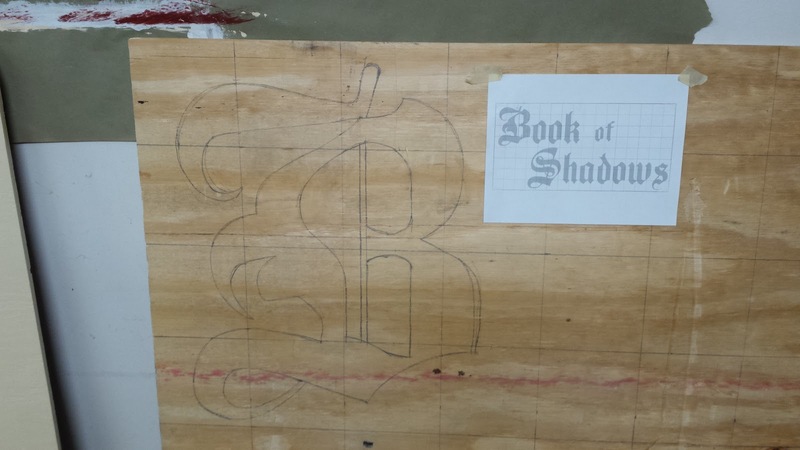 My store, Book of Shadows in Canton Ohio, had its 20 year anniversary in 2016. 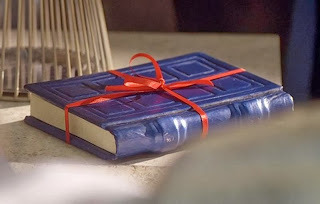 It should have been a time of celebration and there should have been a big expansion and much ado, but because of personal stuff, it kind of came and went with barely a mention. One of the things that I had planned to do for the anniversary, was to make a new marquee sign to put on the facade, a really nice one. Since this location opened, it has had two marquee signs, both made by myself. Last spring we had a big storm and it damaged the current sign. The wood was starting to rot pretty badly due to weather exposure, and about a fifth of it got ripped down by the wind. The building is about 20 feet wide, and the marquee is about six or so feet tall. 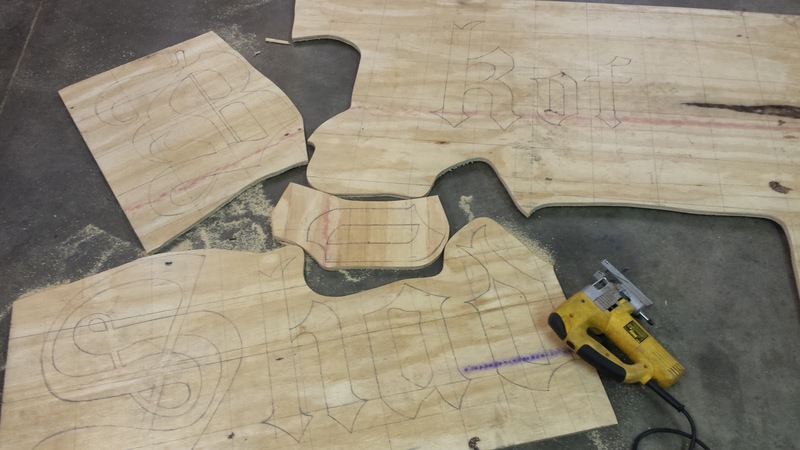 Both of the previous signs were made from two full 4'x8' sheets of plywood (or paneling). The new sign will be a little smaller. 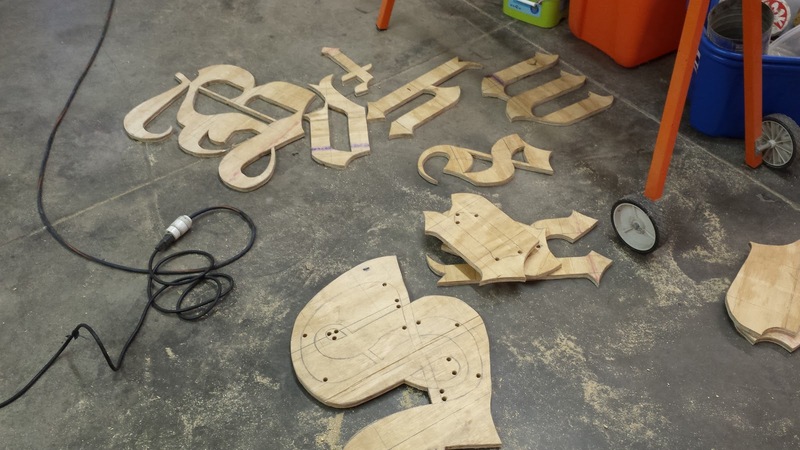 It will be made from a single 4'x8' sheet of plywood that is centered, and flanking it will be two decorative scroll-work pieces and two large wall mounted carriage lantern style sconces. The current aesthetic theme of the shop is sort of a Victorian parlor, with a few goth and steampunk touches. The color pallet is dark red and black, with a lot of brass and stained woodwork. The new sign is going to be raised black lettering, with red edges, on a sandalwood/beige background, with copper trim. 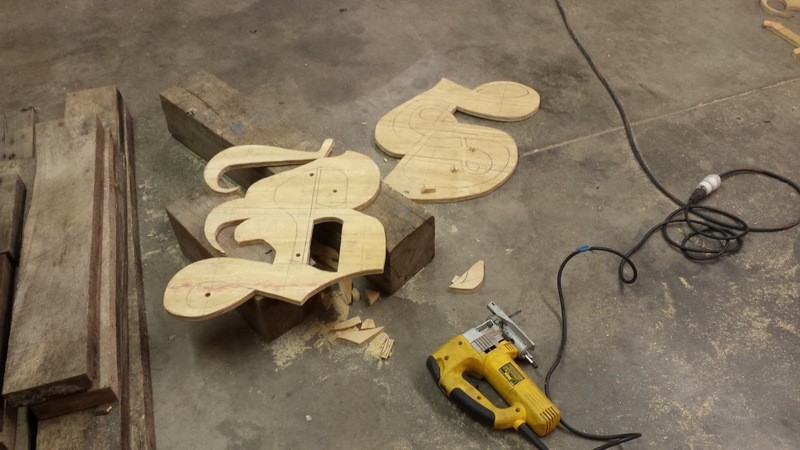 The decorative scroll-work pieces flanking the sign will be black edged and clad in copper, and the sconces are brass. 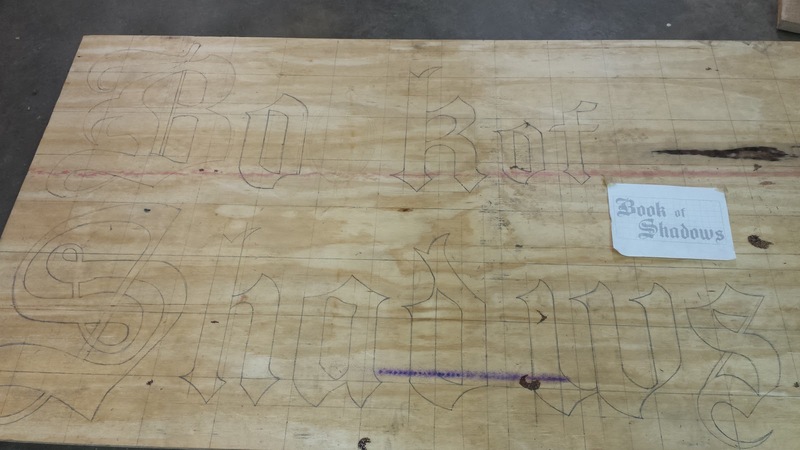 Step number one in a project like this, after determining your scale and design, is to work up a scale image of your lettering, printed out on a grid, so it can be transferred to the full scale material. I chose a font and made a scale vector drawing of the full size sign, and scaled the lettering to fit on the sign the way I wanted it. Then I superimposed a grid over the image at what would represent 6 inch squares at full size, and printed it out for reference. Next I drew a grid on my sheet of plywood, with six inch squares, using a straight edge. These are going to be raised letters, so they are going to get cut out of the plywood, and placed onto another background board. The grid is a common method of scaling images to be transferred. Using a grid makes it easier to free-hand the lettering, because you only have to concentrate on one square at a time, and it gives you reference lines to keep you on track. Just make sure that where an image's outline crosses a grid square line at a certain place on the paper, the same outline crosses in the same spot on the same square on the scaled up version you are drawing, and everything should turn out looking pretty close to the original. Using this method helps to make up for my lack of natural artistic ability. Where there were letters of the same size that matched (like the two O's in BOOK), I only had to draw one of them with the grid. 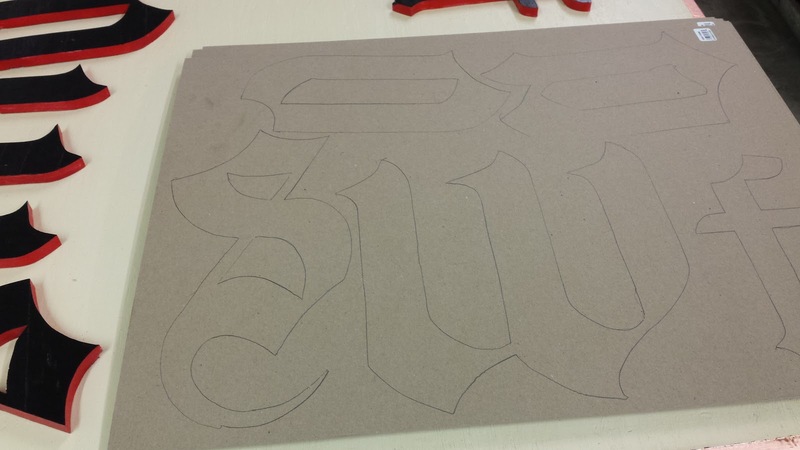 For the second one, I could just trace the first one after it was cut out. 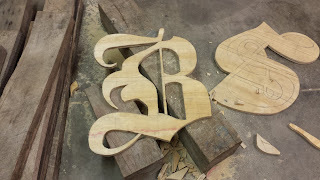 This cuts down on my chances for error, lessens a very tedious and stressful part of the job, and helps make similar letters look more alike. After the letters were drawn on the plywood, I cut each of them out with a jig saw and/or the band saw. 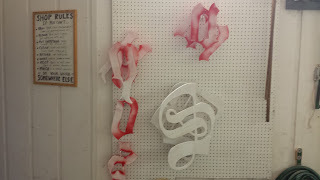 Then I traced any that needed repeated, and cut those out as well. The letters were of a scrolly gothic font, so cutting them out was a bit of a challenge. 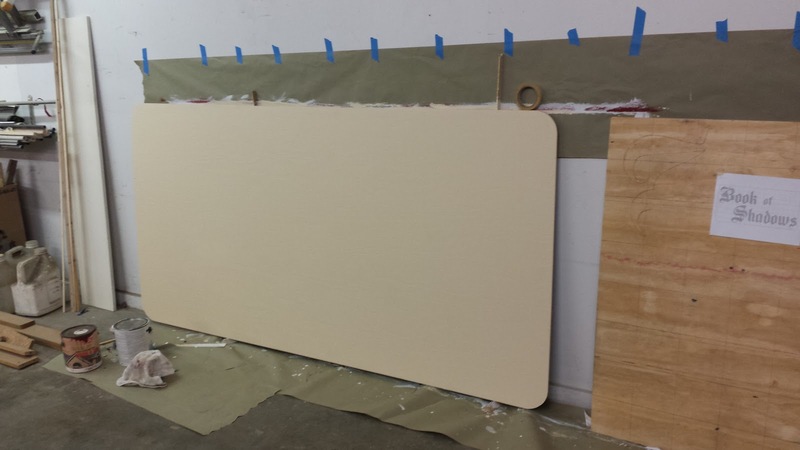 Once all the pieces were cut out, I gave each of them a primer coat of exterior grade latex house paint (white). 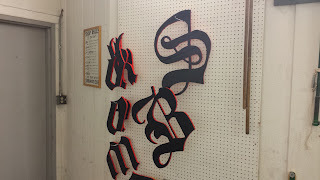 I hung each letter on a peg board in my father's workshop while the paint was drying. After the primer coat was dry, I used red spray paint to color the edges. The faces of each letter were painted with black exterior grade house paint. Then, each was given a couple of coats of spar urethane to weather seal it. I'm making an effort to seal this sign against the weather as much as I can, in the hopes that it will not rot out the way the current one did. Though to be fair, that one did last for quite a few years. 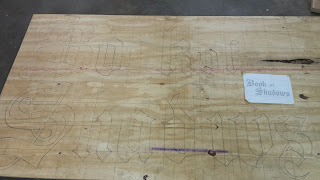 While the letters were still loose, I traced them onto some chip board, just in case I needed to recreate them at the same scale for any reason. I wouldn't have to draw them over again. I will keep these sheets of chipboard for reference for a few years. If it turns out I don't need them for anything, I can always reuse the chipboard for something else. While I was working on the letters I was also preparing the background board. 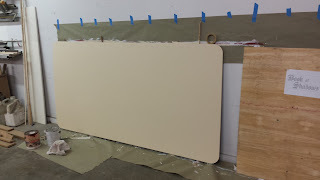 I rounded the corners of another sheet of plywood and gave it several coats of a sandalwood/beige colored house paint. The back side that will be up against the wall got several coats of an odd maroon color, just to use up some old paint that would otherwise have no use, and because it will never be seen. In an effort to spice things up and as a tie-in to the steampunk style, I wanted to add some real copper trim to the background board. I have tried metal leaf paint in the past, and it did not hold up to the weather, and it is very hard to capture the look of metal with acrylic paints. I have a roll of copper foil that I got on sale at the hardware a while back. 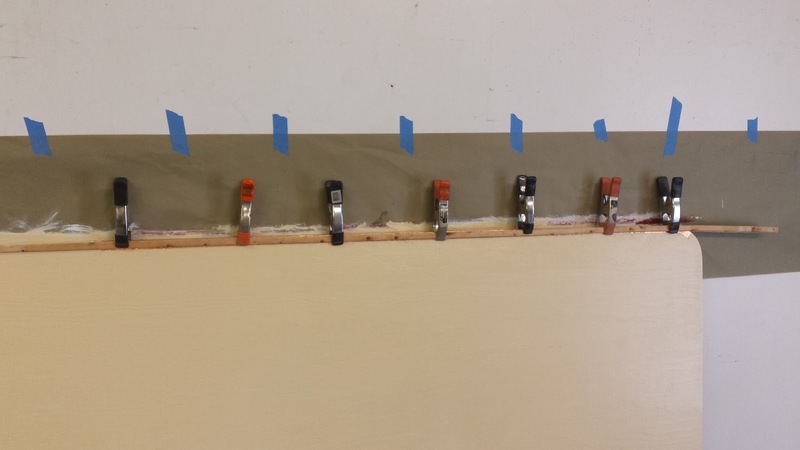 It is meant to be used as a termite barrier, and it has an adhesive backing on it. But my past experience has taught me that the adhesive is unreliable, so I will have to strip it off and use another kind of adhesive to attach the foil to the background board. 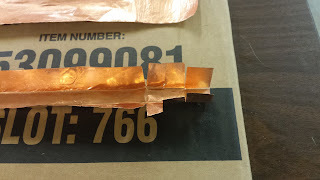 Peeling the vinyl backing paper off of the copper foil was a nightmare. In small sections it is not so bad, but trying to pull it off of several feet at a time, sucked. 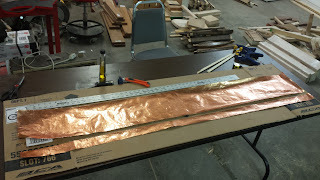 I had to clamp the foil to the table, and pull the backing paper off while gripping it with pliers. The adhesive sticks to the backing paper quite strongly. It's a shame that it looses its grip over time when stuck to anything else. I used Goo Gone and a putty knife to help loosen the adhesive while peeling the baking off. That helped. 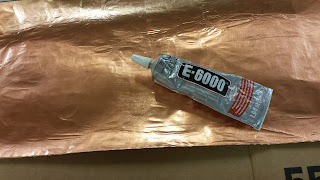 Then I had to use the Goo Gone to take off the rest of the adhesive from the back of the foil. Once the foil was free from its backing and adhesive, I cut it into strips to be wrapped around the edge of the background board. 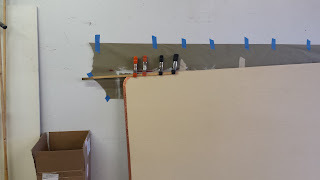 In order to wrap around the rounded corners of the background board, I had to cut darts into the foil. 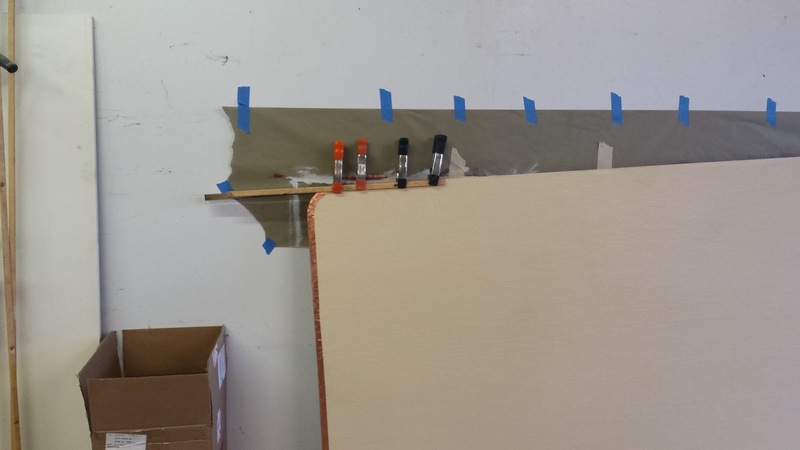 The adhesive that I used to apply it to the background board needed to be flexible, very strong and waterproof. At first I tried caulking, but I had a hard time getting it to stay in place. It didn't have enough initial tack. 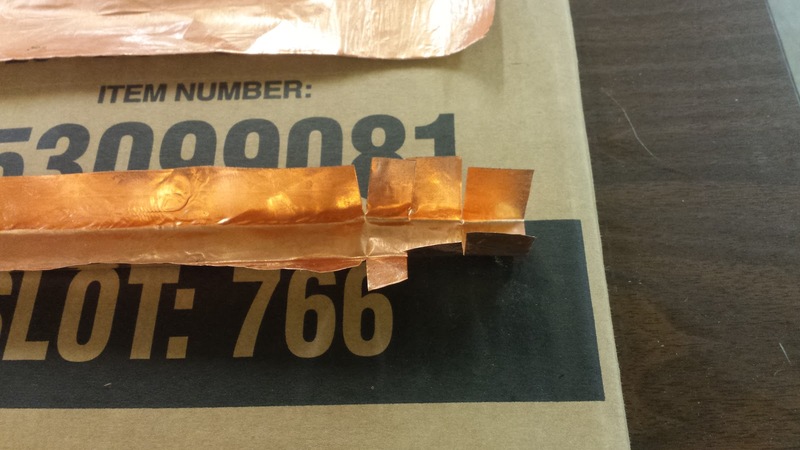 I also thought it might peel from the non-porous surface of the copper foil after it was dry. So, I got a couple of tubes of E-6000. I have had good results with it in the past and it fits all my requirements. In order to keep the foil pressed tightly to the background board while the glue was drying, I used furring strips and many many spring clamps. I worked in sections, maybe four feet or so at a time. I tried to be mindful of how the joints overlapped. 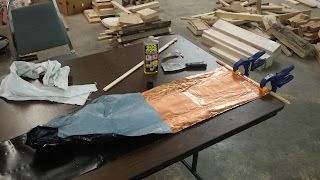 I treated it like metal flashing, always pointing the seam downward, to allow water to run off and not work its way into the seam or under the foil. 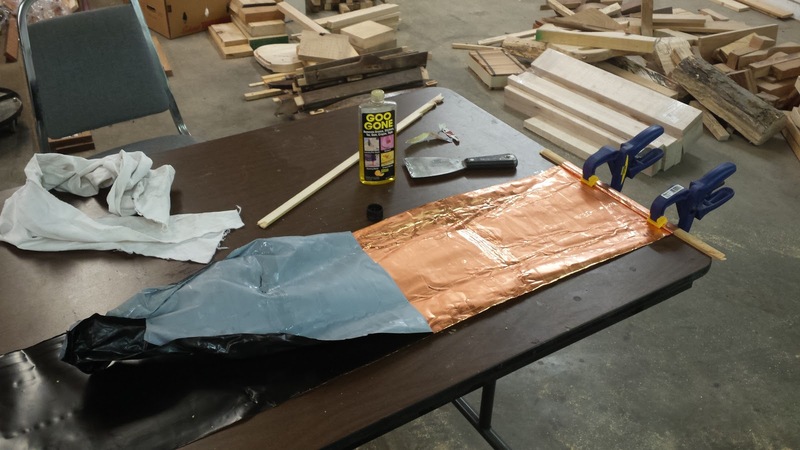 I also made sure the edges of the plywood had several coats of spar urethane applied before the foil went on. That will do it for part 1. More to come on this project. Stay tuned. This is one massive project. But I'm sure it will look great! In case you want do something like this again I am using a nifty litte programm for stuff like this. VERY useful for all kinds of stuff and so easy to use.